Now don't pay attention to all the different lines. It will get confusing. 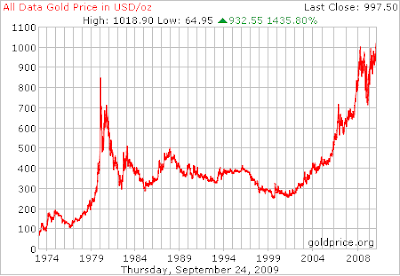 I don't know exactly what they're getting at either, but, this is chart showing the gold worth in 2009 dollars. As you can see, all the lines are the same in 2008 (or 2009, which would be similar although this chart is from last year). But, look back in 1981! Gold is off the charts! 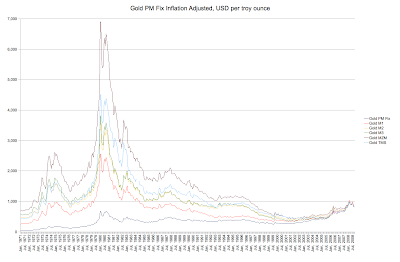 So, in 1981, an ounce of gold was worth at least 5x what it's worth today if you measure it by the amount of goods you can buy with it. Today, an ounce of gold would buy you about one good suit. Back then, an ounce of gold would have bought you at least 7 suits. Understand? Do you see how high palladium was due to demand? Factor in inflation it would probably have been 25% higher. It's hovering around the $300 mark now, so, it's still pretty low. Don't sell palladium now either, if you have the money, buy palladium just as you would gold. 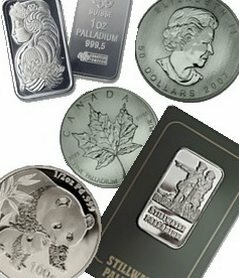 Buy silver too, don't sell silver, keep it. That's my take on things. I know most of you know this but some people have made good investments in precious metals and I don't want them to sell before they reach full potential! Good luck to all! Gold Price Jumps $20 Today!